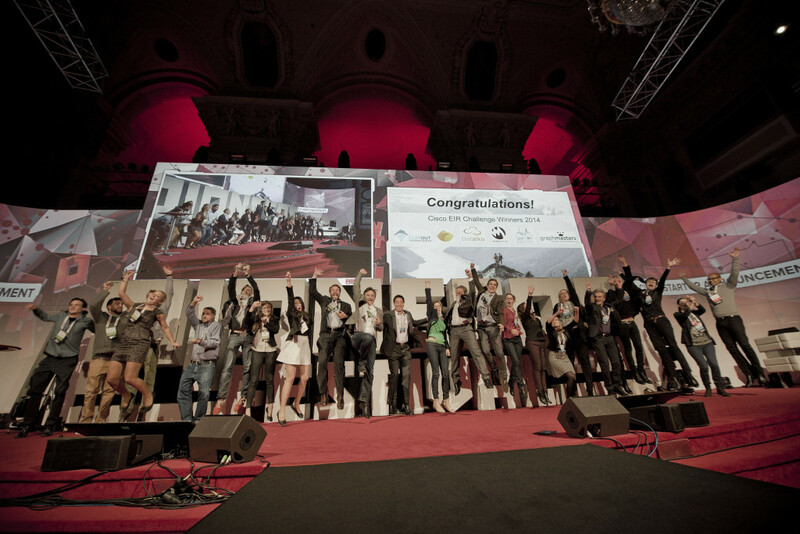 Two days at the Pioneers Festival in Vienna a few days back passed way to quickly. Here is an attempt to remember all the great moments and interesting talks. A bunch of journalists, bloggers and media representatives getting excited about the first unveiling of the flying car, AeroMobil 3.0. It’s like something you were imagining as a kid: sitting in a car and then just taking off into the sky. The futuristic looking sports car was presented accompanied by loud music, a video documenting its first flight and some emotional words from the two founders of AeroMobil, Stefan Klein and Juraj Vaculik. And yes, I want one! Should have listened to my dad when he said I should become a pilot. Pioneers partner Cisco, Konica Minolta and A1 presenting their initiatives for cooperations with startups: Cisco is launching the European version of its Entrepreneurs in Residence Program, Konica Minolta announced a 10 million Euro funding for start-ups over the next 3 years and A1’s CEO Hannes Ametsreiter gave some background about the A1 Startup Campus. 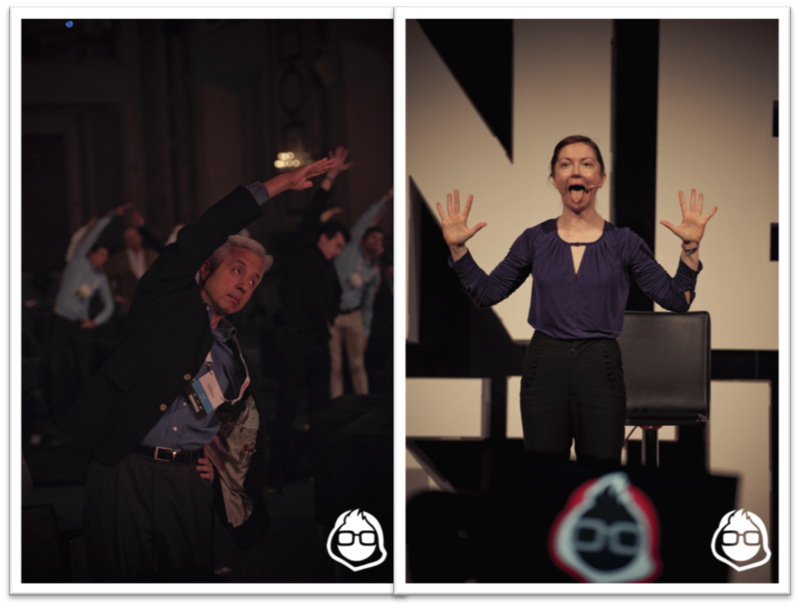 A little bit of breakdance and cheerful introductions by the moderators. Are you ready? – they shout. Audience response is better than expected from a largely European crowd when it comes to participatory cheering. Anyways, two days full of exciting stuff await! Damn, missed the first 90’ pitches. I really have to work on my skill how to be in two places at the same time. Or teleport. Or better look at the schedule. Meeting the team from Anyline at their stand. They captured my attention mainly due to their shirts saying “your mum is still typing”. They developed a scanning software to scan data from not connected objects. The team established use cases with Red Bull, where a sweepstake code is scanned from the cans and with the diabetes app MySugr, to read the sugar level from the MySugr device. Oh, that’s really fun! The mash machine is a music box where by using snippets of music you can create something totally new. We were also quite intrigued by a device called VisionBox. Honestly? Yes, that’s a company providing a really easy to use customer feedback survey tool. We will try it at one of our next events! And in the other corner we met Thomas Maier from the Austrian startup SunnyBAG showcasing their flexible lightweight solar system that can be attached or integrated on/in different kinds of bags. Great idea but we are still missing the style factor. 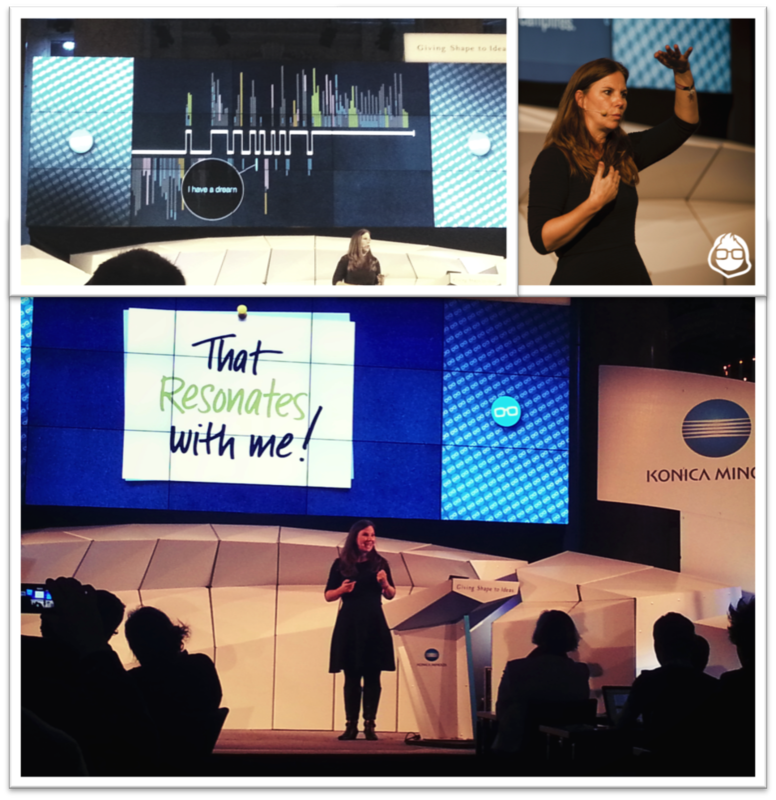 Nancy Duarte’s keynote on storytelling did exactly what she wholeheartedly explained a good speech should do: it resonated with me! It’s been a while that someone was able to keep me focused on solely one thing for one whole hour (I am a notorious multi-tasker), give me goose bumps, make me laugh and did not loose my attention once. I even forgot to tweet! Wait for her speech being posted on YouTube, it’s amazing! At the same time my colleague Verena focused on the importance of a shared vision when corporations cooperate with startups. 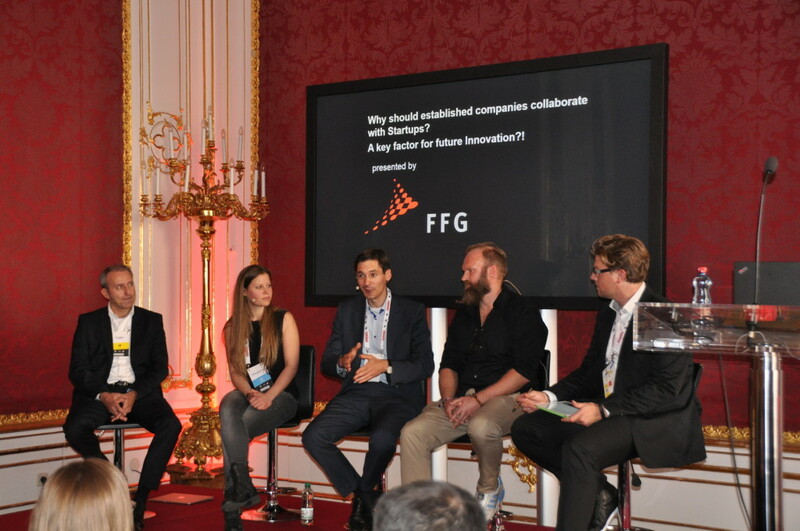 The panel discussion presented by FFG tried to answer the question of how this cooperation could look like. 3:40pm – Be a good cyborg! Wearables are so nearly yesterday, today it’s embeddables! This is coming from John Lunn, Senior Global Director at PayPals developer network. DNA as data storage? Well, apparently not so far off. And he got another point right: we like shopping, but we hate paying. Queuing up for something we don’t like? Acutally not that smart. So PayPal is working on making the payment process invisible. Let’s wait and see. Closing statement: be a good cyborg! Yes, sir! Verena spent some more time in the Spotlight chamber where Braintribe’s Stefan Ebner took the participants on a journey into the hybrid world of startups and corporations, where you have to be at least bi-lingual: speak startup-ish and enterpris-ish. Move to Singapore. The panel discussed why South East Asia is one of the hottest markets and showed some compelling figures on the usage of digital devices in countries like Indonesia, Thailand and Singapore. Impressive! We already knew that the FiftyThree pen is really cool because we already bought it as soon as we saw it in Business Punk in August. To see what people are actually doing with it was still really great. That’s how you get 2000 ways to draw a circle. Jumping, laughter and happy faces on the main stage when Martin Bittner and Tom Yoritaka from Cisco announced the winners of the Cisco Innovation Challenge. 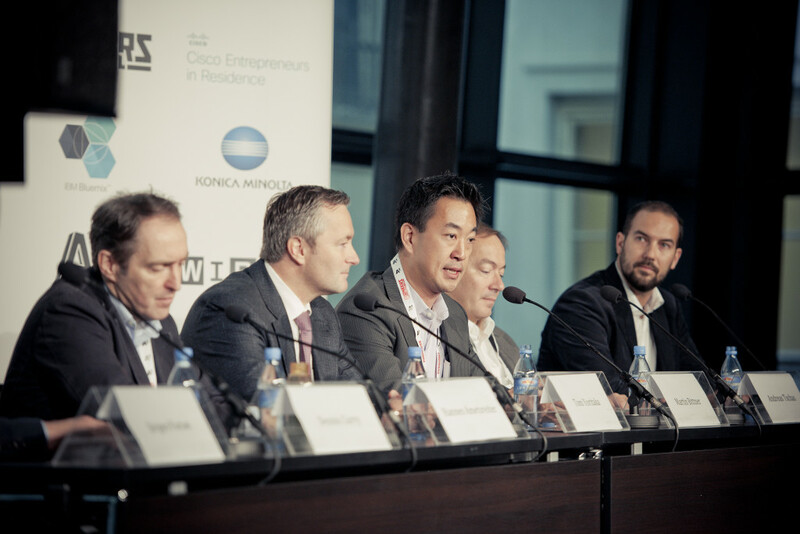 Meet the latest Cisco Entrepreneurs in Residence: Big Data and analytics startups Dataiku, MammothDB, Metat Innovations, Smart City startups Graphmasters, ICE Gateway and IoT/Cloud startup Flatout Technologies. Yoga? Uuuahh, too tired. Let’s have a coffee instead. 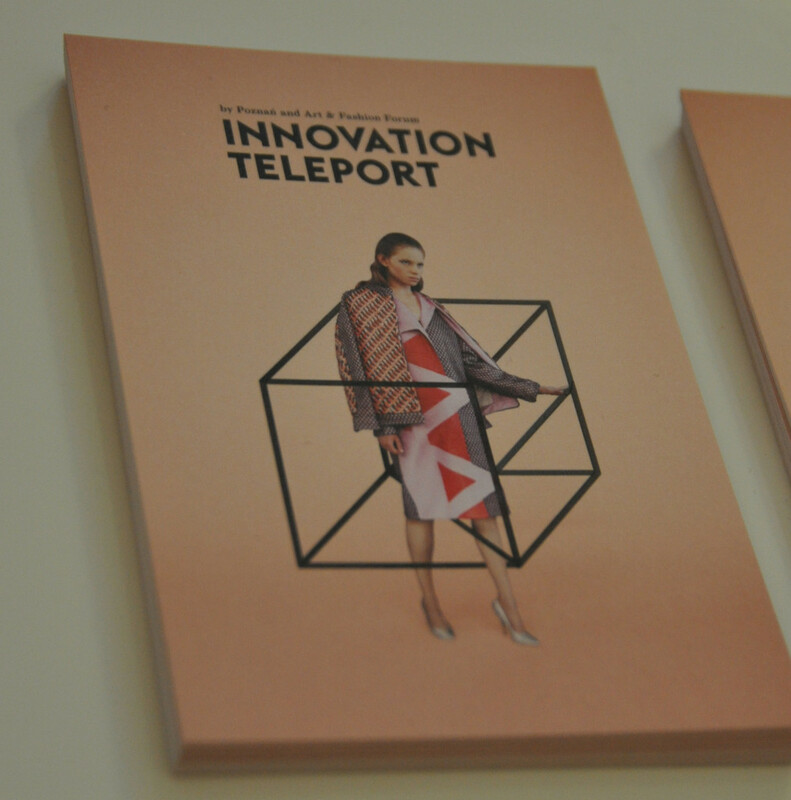 Eleven startups had the chance to pitch their ideas this morning in just 90 seconds. Timesulin (smart replacement caps for insulin pens), Peared (smart and stylish hearing devices for the elderly) and Xensify (Cloud Infrastructure for Micro-location Interactions) are only three of the presented ideas. On screen: a teddybear. And the message? Combine traditional toys with AI and robotics and you get cars that race around a track, learn while doing so and become faster with every race. Robotics startup Anki is presenting Anki Drive. The racetrack can simply be unrolled like those car carpets we used to have as kids (but of course, way cooler!). After some set-up time the cars were racing around on stage. The new area of toys has come. Sorry, dude, you lost me. So, the gist: The future of banking is that there will not be any banking as we know it now. Word. The entertaining part of Pioneers Festival! Three startups are invited to pitch their ideas and get seriously roasted by the judges on stage. And I guess, to make it more fun, the organizers chose some lower potential startups. The audience can decide during the judges’ interrogation if they want to see some more roasting. 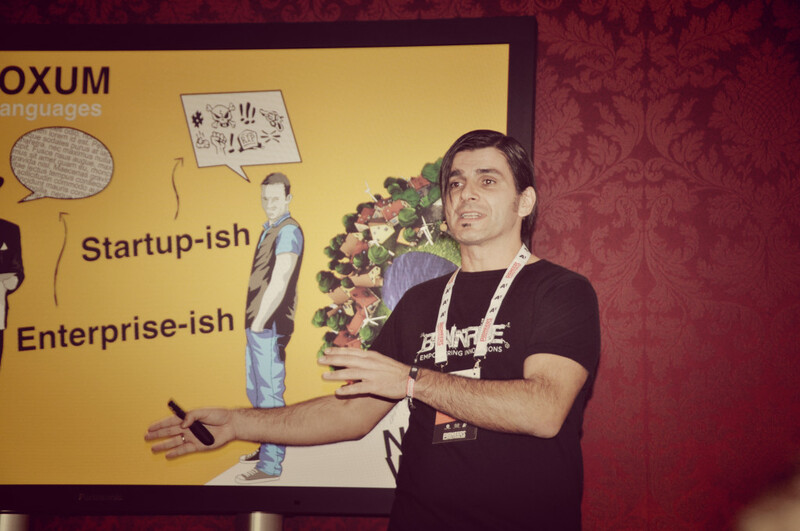 And who thought we would see one of the VCs eating roasted insects on stage? Pioneers Challenge finals: 8 startups left from over 1000 applications. And it’s their last round of pitching. Mimi Hearing Technologies presented smart hearing technology; Robo developed a programmable robot to teach kids how to code; Crate Technology offers elastic data storage; BRCK brings WIFI to the most remote and harsh environments; Oradian impresses with a banking software as a service for microfinance institutions that aims at financial inclusion; Tag & Find showed a wireless tracking device for personal items with cutting-edge RFID technology; OptoForce is revolutionizing machine sensing and Owlin turns news into actionable intelligence especially when it comes to trading. And the winner of this year’s Pioneers Challenge is… tatatataaaa… Oradian! The Croatian startup provides a financial inclusion ecosystem delivering a disruptive, cloud-based service that radically improves performance of financial institutions, especially in underdeveloped countries. As the winner Oradian receives a 50.000 Dollar seed investment of Pioneers partner Speedinvest as well as partner meetings with globally renowned accelerators Y Combinator, Tech Stars and Lemnos Labs. 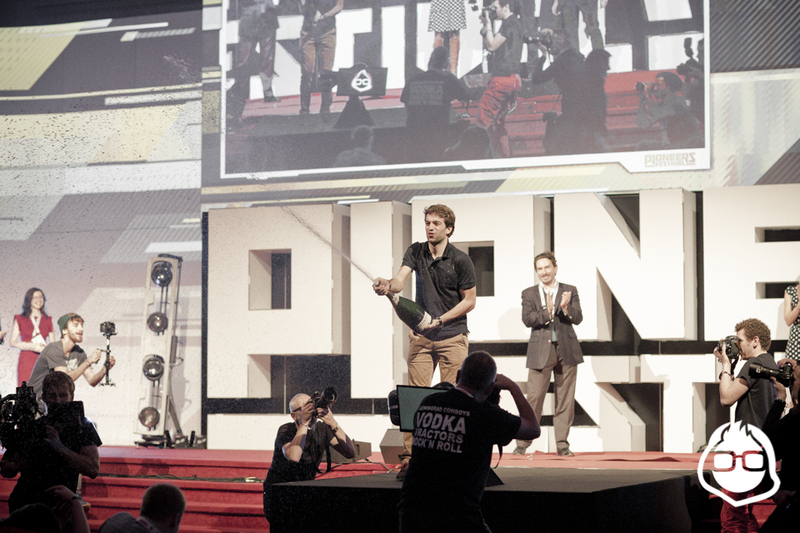 After a champagne shower and lots and lots of cheering the Pioneers Festival 2014 came to a close. Well, not the fun part of course. Birds told me that the famous Pioneers after-party ended long after the sun rose again. And the best part? 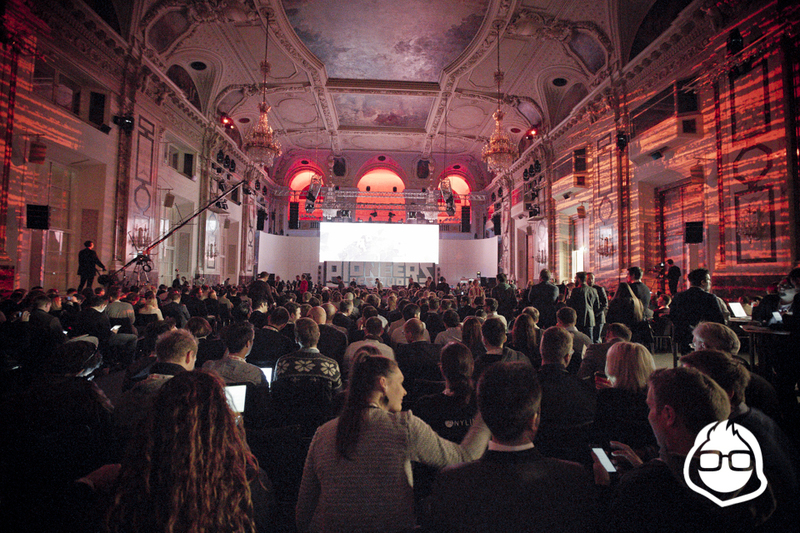 We don’t have to wait a whole year for the next Pioneers Festival! Mark your calenders: on 28-29th of May it’s Pioneers time again!